Marywood Health Center is a ministry of the Dominican Sisters~Grand Rapids. We offer holistic, restorative healing that focuses on clinical and spiritual care for people recovering from illness or injury. 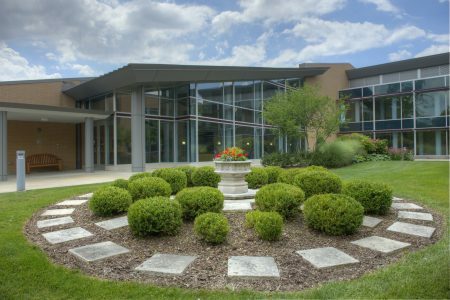 Located on the beautiful Marywood campus, our short-term rehabilitation center offers individualized and goal-oriented therapy services. Accommodations are top-notch with private rooms in a natural, serene campus. Currently we are seeking the following to join our team! Maintenance Technician – Full Time with Benefits. Hour for positions: 8:00am – 5:00pm with flexibility. Must be available for on-call services as needed. In the role, you will be surrounded by colleagues who are committed to excellence in their roles and you will be provided an environment of encouragement and career growth. The primary purpose of this position is to maintain the community and equipment in a safe and efficient manner in accordance with current federal, state and local standards, guidelines and regulations governing our community, and as may be directed by the Environmental Services Supervisor to ensure that our community is maintained in a safe and comfortable manner. Performs routine maintenance and repairs in the building, which include significant repairs to equipment, plumbing, plastering, electrical, carpentry, mechanical, etc. in accordance with established procedures. Ensures that inside and outside services are properly completed and supervised in accordance to contracts and work orders. Coordinates daily maintenance services with department involved when performing routine assignments. Keeps abreast of economic conditions/situations and recommends adjustments in department services to the Environmental Services Supervisor. Exposed to a variety of personalities and reactions from people. Physical work environment various from high-paced to normal business office environment. Functions cooperatively as a member of the team working to achieve goals. Supports all safety and sanitation standards, supporting company policies and practices. Ability to push, pull, move, and/or lift a minimum of 20 pounds to a minimum height of 5 feet and be able to push, pull, move, and/or carry such weight a minimum distance of 25 feet. Functions independently and have flexibility, personal integrity and the ability to work effectively with older adults, personnel, and support organizations. Must possess, as a minimum, a high school education or its equivalent. Must have, as a minimum 2 years’ experience in maintenance/plant related position. Must be knowledgeable of boilers, compressors, generators, etc., as well as various mechanical, electrical and plumbing systems. Must have the ability to read and interpret blueprints and be knowledgeable in building codes and safety regulations. Attention to detail a must. Must possess knowledge of the appropriate skills for communicating with individuals of all ages, especially of the geriatric population. Previous experience in a health care industry highly preferred.